Scottish Highland Dirk Celtic Top.The Highland dirk is known to have been in use since the 5th century. Its trademark distinction from European daggers is in in having but a single edge. This causes the blade to be heavier and thusly perfectly balanced for use as a short sword. 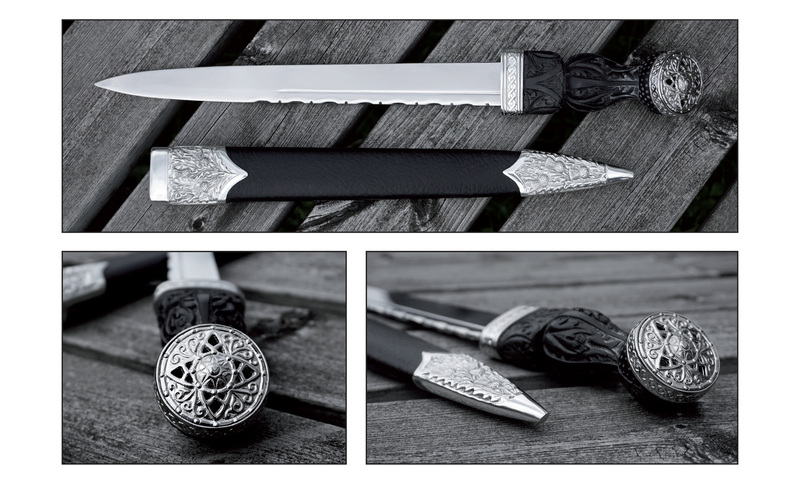 This Highland Dirk is imported directly from the Art Pewter Company of Scotland and is made in the style of the 18th century Dirks. Leave it to the Scots to make dual purpose weaponry!This traditional Highland Dirk has thistle detail to the handle and mounts, Celtic Compass top and a wood covered black leather sheath. The mounts are pewter with a plated finish of Palladium, and the blade is Stainless Steel. Blade measures 11 1/2". Handle measures 5 1/2". For an over all length of 17". Dirk in the sheath gives a total length of 18 1/2". Comes boxed with general historical notes. Made in Scotland, please allow 2-4 weeks for delivery.